Hollandaise sauce is a delicious sauce that is rich and decedent. You can make hollandaise sauce at home, it may take an extra step or two, but this sauce is so much better than any pre-packaged sauce you can buy at the store. Hollandaise sauce is made for asparagus, and eggs Benedict. The key to making hollandaise sauce is to first heat the butter up to melting separately, and then start to make the sauce, so let’s get started. 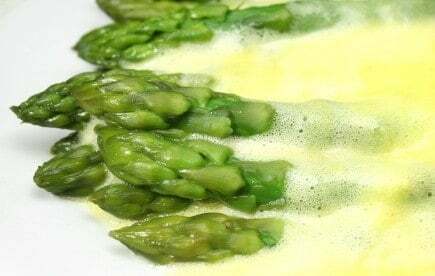 I personally love to steam up some asparagus and serve the asparagus with hollandaise sauce. While making hollandaise sauce may take an extra step or two, making hollandaise sauce can be done with a little bit of patience, and I promise homemade hollandaise sauce is definitely a recipe you want to add to your personal library. You can make am amazing Hollandaise sauce, it goes perfectly with asparagus. Melt the butter in the microwave in a glass dish. Let the butter begin to cool slightly, and skim off anything that is on the top. Set up a double boiler, and whisk egg yolks and the water in a bowl until they are light and fluffy. Pour egg yolks into the double boiler. Whisk eggs continually while eggs are in the double boiler, they will begin to thicken slightly, and this will take 2 to 3 minutes. Begin to drizzle in warm melted butter slowly, and continue to whisk the egg and butter mixture. Once the butter is totally incorporated add lemon juice, hot pepper sauce, and salt and pepper to taste. This sauce must be served within 30 minutes of making. Try a blender version of Hollandaise Sauce. It makes a great sauce that is nearly foolproof. Or, adapt this one and make it using a blender. Hey I really liked this Hollandaise sauce. I served mine with some Asparagus. Mmm..I like the foam! A great sauce paired with so many vegetables. Honestly, I think I could pour this sauce over just about anything. Ohhh, hollandaise … I could drink the stuff! And that asparagus looks so good swimming in it.